Drain and boil the soaked chickpeas for about 1 ½ hours, or until they are soft. Drain and reserve the cooking liquid. Blend to a purée in the food processor. Add remaining ingredients and a little of the cooking water (one tablespoon at a time) and blend until you get a creamy consistency. Add more lemon juice or salt to your liking. Spread the hummus onto a flat plate and garnish with two tablespoons of olive oil dribbled on top, a sprinkle of paprika and chopped parsley, and few whole cooked chickpeas strategically placed for a beautiful presentation. 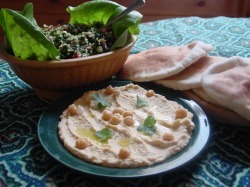 Serve with pita bread, Arab flatbread, and tabbouleh. Chickpeas, also know as Garbanzo beans, contain more iron than other legumes and is also a good source of unsaturated fats. Tahina is made from sesame seeds - the hulls are removed and the seeds are milled to form a sesame butter. Tahina is a rich source of calcium.